Every passing year, manufacturers are under more and more pressure to develop sustainable packaging solutions that reduce their carbon footprint and attract eco-conscious consumers. This isn’t an easy task, but corrugated packaging offers surprising environmental benefits for manufacturers looking for a realistic solution. 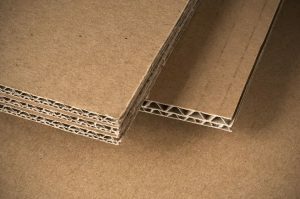 Corrugated packaging has the potential to be made entirely from wood chips and other leftover materials that would otherwise go to waste during the paper-making process. This is a sustainable and environmentally responsible way to provide packaging solutions. Even if corrugated materials aren’t made from waste products, suppliers use managed, sustainable forests with quick-growing pines and replace harvested trees with seedlings to prevent deforestation. In addition to the methods listed above, corrugated packaging can also be produced from recycled paper like cartons and newspapers. It can even be recycled again after use, making it a cycle of sustainability without waste. Even better, corrugated packaging is meant to be functional, not attractive, so it is made without toxic dyes, bleaches, or other contaminants. It’s great that corrugated packaging can be recycled, but before it even reaches the recycling bin it can also be reused to reduce packaging costs and environmental impacts. In fact, many corrugated case styles are designed specifically for reuse; some are even easily collapsible. To learn more about corrugated materials and other important packaging elements like cartoning, tray forming, and casepacking, call (781) 986-7500 to speak with an expert at Econocorp. As a recognized worldwide leader in packaging, Econocorp offers ideal solutions for moderate and lower production volumes.